At the bottom of this page are two of the Wheel of Fortune images showing the resonant hex patterns. Also shown is the Jude3 autotrader shown today in the AUX page. 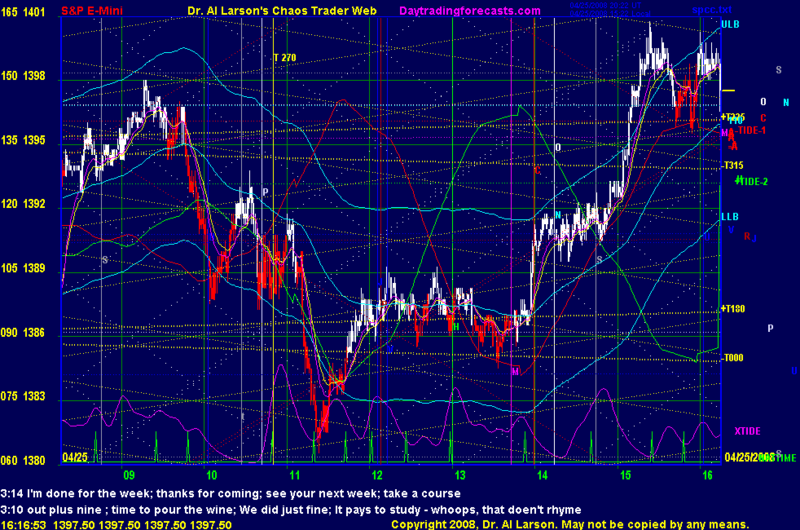 The FOG pattern I used has been archived in the Certified Chaos Trader's Room. 1:42 Got a minor break of the congestion lows- I suspect it is a head fake. 1:35 Sun 45 degree support is at 1384 ( 1393-9) . If it holds we could get a rally. 1:32 getting some selling. This suggests we may have inverted to the red -Tide. 1:28 the mid-point of a hex pattern is a balance point, a point of instability. This will come near the next Tide time. 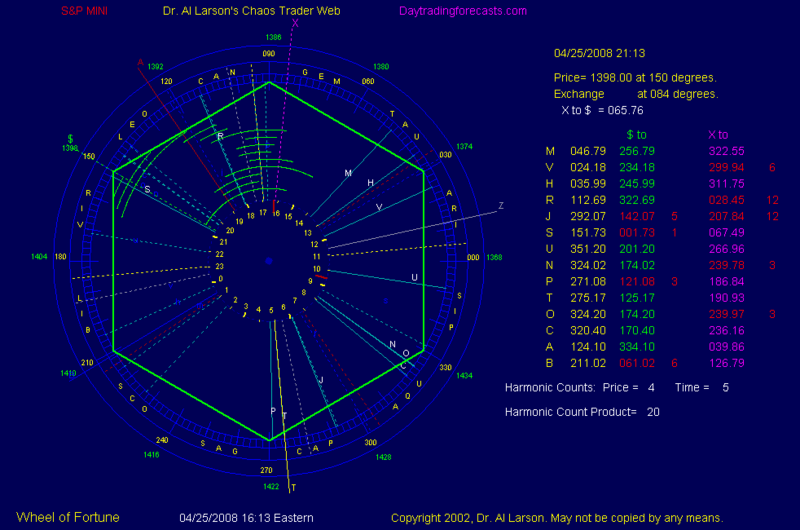 1:08 we are in a congestion between 1389.25 and 1385.5; congestions are balance zones, to be followed by chaotic moves. 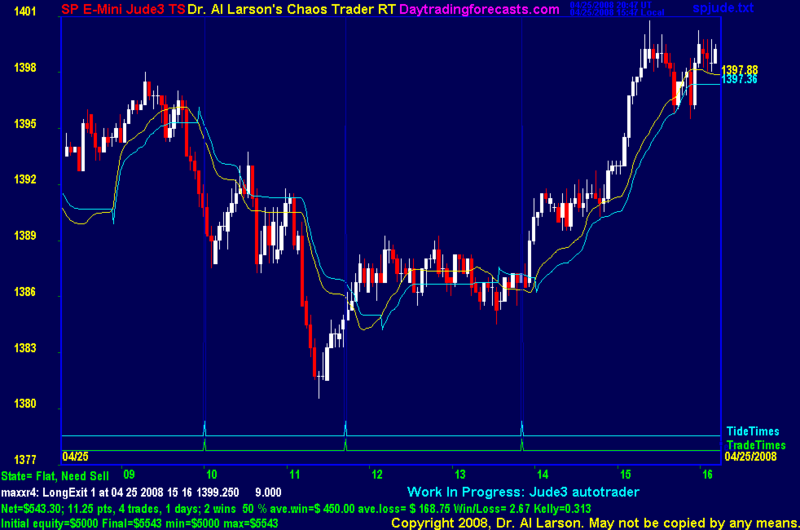 10:46 the cycle used in my Franklin trading system is about to turn up. 10:20 had I taken that early short, I would have been stopped out by now for about 2 or 3 points. The moon overhead position moves about 50 minutes per day. Forms a short term cycle. 9:38 at the bottom of the Chaos Clinic screen is a magenta line labelled XTIDE-not to be confused with XTide2Plus. 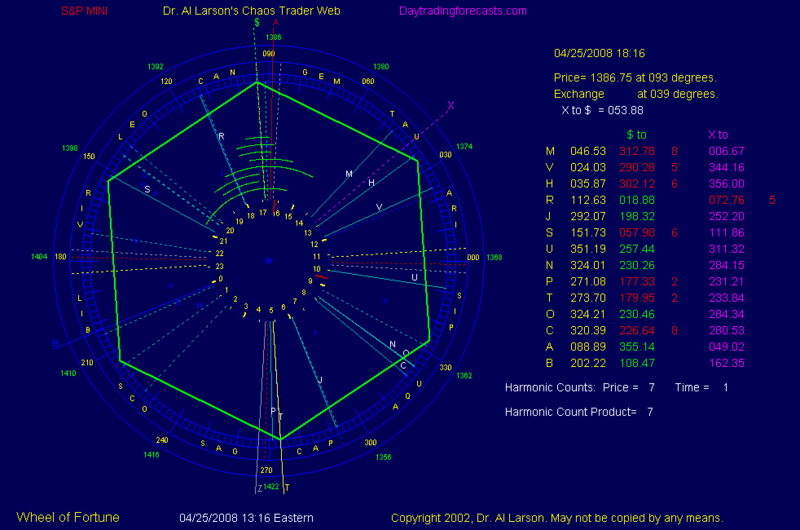 4/25/2008 1:41:49 PM Mountain mm:: Again: beautiful how the pit pushed the price 13 pts from one S/R level to the next ! 4/25/2008 1:21:11 PM Mountain bm:: Al, thanks again. I will be one of your student soon. Have a good week end. 4/25/2008 12:29:15 PM Mountain bm:: Today is so far one of the most educational day I had in my life.As we say in French,al, Respect!! 4/25/2008 8:26:28 AM Mountain gd:: Hi Al, Is the spkiss chart a 1 minute chart?